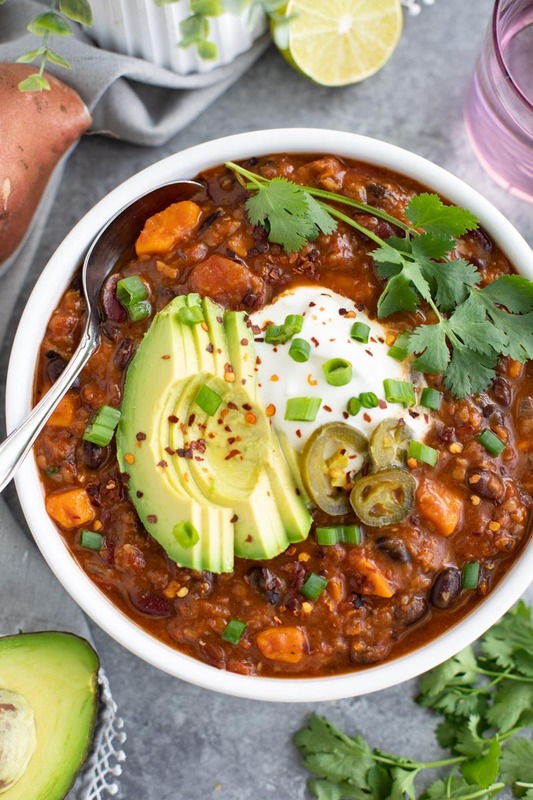 You only need one pot to make this sweet potato lentil chili and you can easily customize it with whatever veggies you have in your fridge. It has two flavor-loaded ingredients that you’d never expect to find in chili! Vegan. I make soup quite a bit during the year. Why? As well as being easy to prepare, it’s really good for the budget. All of the ingredients for this chili only cost around $15, that’s only $2.50 per serving. That’s great for two nights worth of meals for two people! Or you could look at it like you’re feeding a family of four for only $15! Travis always says it’s too hot for soup during the summer but I make it anyway, I’m the one cooking! I make this sweet potato lentil soup throughout the year, but we especially love a big bowl of chili when it’s cold outside. I serve this vegan cheddar onion bread with the soup for dipping. I may have eaten more bread than soup, it’s seriously addicting. These delicious vegetarian meatballs are packed full of lentils and quinoa! They have the perfect texture and will please any meat-eater! Vegan, nut-free, soy-free. Now that my husband and I are both vegan, I’m trying to veganize all of our favorite meals. When I saw my husband popping quinoa meatballs into his mouth right out of the skillet when he thought I wasn’t looking, I knew this recipe was a keeper! These vegetarian meatballs taste so similar to regular meatballs that you won’t even miss the meat! They’re jam-packed with flavor and texture, they’re seriously delicious! Meatless meatballs don’t contain any animal-based products. Typical vegetarian meatballs are made from lentils, chickpeas, tofu, beans, rice, quinoa, or oats. There are so many options but this is my favorite variation. Vegetarian meatballs also usually have a binder of a flax egg or chia egg to hold it together. Meatless meatballs can have just as much flavor, texture, and plant-based protein as the animal-based version. I prefer a flavorful vegetarian meatball that is firm and has substance to it, no mushy meatballs for me! I also prefer to bake the quinoa meatballs instead of sauteing them because I try not to cook with oil if I can help it. Lentil quinoa meatballs are really easy to make, they’re packed with protein, and they bear a striking resemblance to real meatballs. They’re delicate, with big Italian flavor and baked to toasty perfection. They’re made of simple ingredients that taste delicious and are good for you! Start by cooking the quinoa and lentils separately and set them aside until later. Next, mix the flax egg together and put it in the fridge to set up. Add all the ingredients to a food processor and blend until you have a chunky mixture. Form the mixture into 12 large or 24 small vegetarian meatballs and then bake them to tasty perfection! These quinoa meatballs are so delicious coated in marinara and swimming in hot noodles, it’s definitely one of our favorite vegan dinners! I’ve also made these lentil quinoa meatballs with almond flour or pumpkin seeds in place of the blended sunflower seeds. The almond flour gives them a delicious nutty flavor, but sunflower seeds are very inexpensive so I usually will use those instead of the almond flour. These lentil quinoa meatballs definitely satisfied my craving for spaghetti and meatballs, and Travis really loved them, so this recipe is definitely going into my meal plan rotation. I hope your family loves them just as much as we do! If you have any leftovers, you can freeze the vegetarian meatballs on a baking tray (make sure there is space between each meatball) and then put them already frozen into a freezer-safe container. If you put all of the lentil meatballs into a container together and then freeze them you will end up with a big clump of meatballs. Or you can use the leftover quinoa meatballs for vegan meatball subs with lots of tomato sauce, vegan cheese, and toasty rolls. It’s health-ish comfort food that will please everyone! 49 Super Tasty Lentil Recipes for Lentil Lovers! If you’ve tried these vegetarian meatballs or any other recipe on the blog, please remember to rate the recipe and let me know what you thought of it in the comments below, I love hearing from you! You can also FOLLOW ME on FACEBOOK, TWITTER, INSTAGRAM and PINTEREST to see more delicious vegan recipes + our monthly trips to Disney World!